Fits 1" Webbing, integral drain port Low-IR, 80 lb. 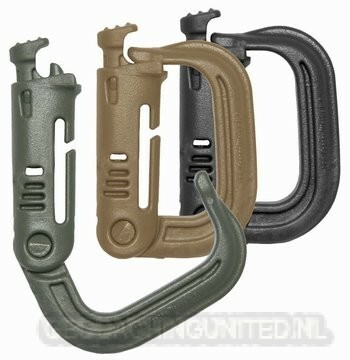 break strength Color Options: Black / Foliage Green / Khaki. The Fastex® Grimloc™ Locking D-Ring can be used on any 1" wide piece of webbing and replaces the metal carabiner for attachment of lanyards, weapons, and accessories. It is fabricated from high strength lightweight plastic, incorporates GhillieTex™ IR-signature reduction technology, and resists solar heating. Its latch is designed with a detent to maintain an open position if needed and, while strong enough to carry equipment, it will break away with a soldier's weight, eliminating snagging hazards which can cause serious injuries. The Grimloc™ Locking D-Ring's release button is textured for ease of use with gloved hands and works as a pump for purging trapped sand or water through integral drain holes. Since the Grimloc™ is made from plastic, it will not serve as a platform for ricochets or become a secondary projectile.